The profit on rental property enjoys the lower long-term capital gains rates as compared to the profit on “flipped” property which is taxed at ordinary income rates.Salary, wages and commissions, along with interest and dividends are taxed at ordinary income rates which can range from 10% to 39.6%. However, capital gains rates, for property held more than 12 months, are much lower ranging from 0% to 20%. 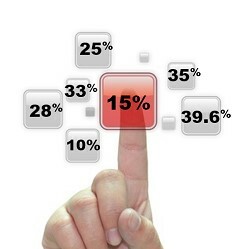 Taxpayers in the 25-35% brackets pay LTCG rates of 15%.